Advancement and Innovations in Technology resulted in getting more compact devices. If you remember the last decade you will realize that personal computers, cell phones, laptops were much bigger in size and there were fewer features available. Users had to spend more time to perform their work as processing speed was much slow. After the induction of micro technology, the scenario is entirely different now. People are having smaller work satiations, slim laptop with lighter weight. Professionals need to perform their daily activities onsite and offsite for which they need to carry their business related information and material with them. Same is the case with students; they need to carry their assignments and other study related material in home and campus as well. You can have a look to the 5 Top Netbooks For Students and Top 3 Laptops for College Students. This is difficult to carry a laptop all the time just because of its size and weight. Using a Tablet is the most appropriate choice that can be used to meet your expectations in an excellent way. Industry-leading brands are trying to win the race by engineering the most advanced-featured tablets. Samsung introduced its Galaxy Tab 2(10.1) to provide excellent customer’s experience which contains multiple attractive features, bringing a new level of interactivity and multimedia sharing to your entire social network. Latest android platform, built-in exciting apps, entertainment hub and full Google mobile services provide you the feel of brilliance. I am going to give you the brief introduction about exciting features and technical specifications which will make you understand about Samsung Galaxy Tab 2. Galaxy Tab 2 supports 2G and 3G network, so you don’t need to keep and extra cell with you. You can perform the functions of laptop and cell phone at the same time. 1 GHz Dual-Core processor makes it possible to perform your activities in efficient way. 10.1” WXGA (1280×800) PLS TFT provides you vivid view of your videos, pictures and apps. You can store your precious moments with Main (Rear) 3 Megapixel Camera and enjoy video calling with front camera so you are no more away from your loved ones. Galaxy Tab 2 supports all industry-leading audio and video formats to be played so you don’t need to convert your media files. Playback/recording is featured as Full HD@30fps and HD@ 30fps. You can make it more user-friendly by adding exciting value-added features and services (Samsung Hub, Samsung Hub Widget, Samsung S Suggest, Samsung ChatON mobile communications Service, Google Mobile services and etcetera) depending upon your geographical location. Android 4.0(ice cream sandwich) operating system makes it efficient and that can be upgraded to Android 4.1(Jelly Bean). You can connect your Tab with Wi-Fi 802.11 b/g/n, Bluetooth 3.0 and USB 2.0 Host. Wi-Fi hotspot feature allows you to provide internet connectivity to your friends and family. Samsung Hub, S Suggest and Android Market offer you border-less bountiful entertainment with Readers, Games, Music and Videos. So every on in the house from any age group can browse the stuff according to their choice and mood. Multimedia sharing has become at your fingertips with AllShare Play feature, now you can connect all DLNA-compatible devices including your computer or laptop, phone and TV. You can enjoy playing movies and games on big screen with you Tab 2. Cloud media storage provides extra flexibility to cater everybody’s different data needs. 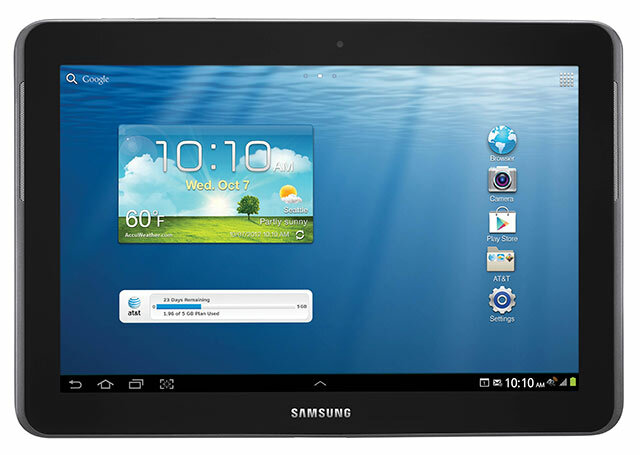 Galaxy Tab 2(10.1) provides you the convenience to communicate with you family and friends. You can have fun through Google+ as this helps to make group video call. ChatON makes communication more amazing and personalized with multimedia messaging, easy content sharing of photos, videos and animated add-ons. An array of in-box and optional accessories make it more attractive and provide ease to interact with Galaxy Tab 2. You can add Desktop Dock to show movies and photos to whole family while recharging it. Keyboard Dock allows you to enjoy the working as on laptop. Book Cover helps the device to protect screen and maintain its appearance across rigorous use over time. Have a look to the white-color version of the Tablet available in the market for sell. 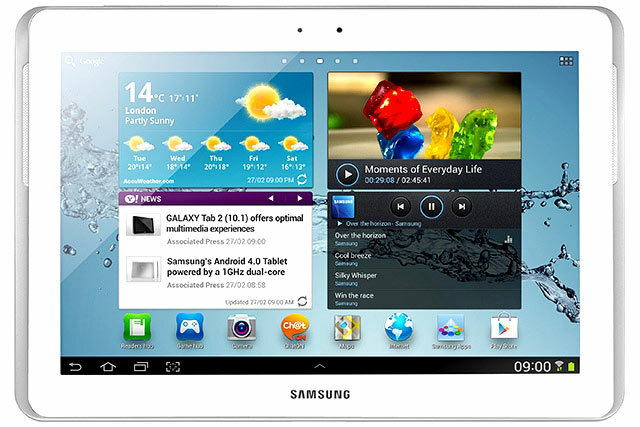 Samsung Galaxy Tab 2 (10.1) price is India for only WiFi version 16GB is 9,999Rs and 16GB WiFi with Cellular is 15,999Rs. You can buy this tablet from Flipkart and other online stores. Galaxy Tab 2 is renowned as the most attractive Tab with larger display, super slim body, highly efficient processor and elegant screen. You can enjoy the fun while working on industry-leading and most advanced Tab.